Romare Bearden’s undisputed mastery of collage is highlighted in DC Moore Gallery’s new exhibition Romare Bearden: Idea to Realization. This focused show features a rare and vibrant group of original artworks that blend paint, photographic images, and abstracted cut-paper elements. Created as maquettes for murals, mosaics, book jackets, and other projects, most of them are being exhibited for the first time. The exhibition, which is one of the inaugural shows at the gallery’s new location 535 West 22nd Street, is on view from February 3 to March 12. From about 1972 to 1984, Bearden (1911-1988) was involved in many mural projects. His first effort was also his largest. In 1972, a sixty-foot high, two-part temporary billboard, The Grill, 42nd Street, was installed in Times Square. This was followed by murals in several different media in Berkley, California; Atlantic City, New Jersey; Hartford, Connecticut; Baltimore, Maryland; Charlotte, North Carolina; and elsewhere. One of the most striking mural maquettes in the exhibition is Pittsburgh Recollections, a bold modernist narrative and historical panorama that traces the city’s development in a series of vignettes. Beginning with a reference to the original Native American inhabitants of the area, it proceeds through early industry to the prosperous steel mill era, and finally to the shift to a modern economy based on technology, science, and education. Bearden’s ideas for the mural became a large-scale mosaic of ceramic tiles measuring thirteen by sixty feet, which was installed in a downtown Pittsburgh subway station in 1984. Bearden also frequently collaborated with fellow artists, writers, musicians, and choreographers by creating artworks for books and designing book covers, posters, costumes, and stage sets. One such example in the exhibition is Bessie, Duke, and Louis, a dynamic homage to these three jazz legends that appears to be related to a book project conceived by Bearden and two close friends, Albert Murray, a novelist and jazz critic, and Sam Shaw, a photographer and film producer. 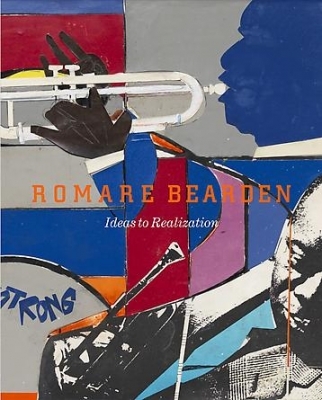 While the book was never realized, it inspired Bearden’s Jazz series of 1981. The series was in turn prompted by a 1961 film, Paris Blues, which was produced by Shaw and set in Paris in 1950, the same year that Bearden was there on the GI Bill. Louis Armstrong performed in the film, and Duke Ellington composed the musical score. A Symbolic Pageant of Afro-American History is another powerful collage, one in which the African-American experience is concisely depicted in four panels labeled “The African Heritage,” “The Rural Scene,” “The Urban Crisis,” and “Building the World of Tomorrow.” The focal point is an image of Dr. Martin Luther King Jr., a pivotal figure in modern history, surrounded by unnamed, representative characters that span the centuries, from ancient Egyptians to a computer technician and a draftsman. Bearden saw collage-making as improvisation, similar to the creative process in jazz and blues. He started with an idea, and then let it evolve more or less spontaneously. “You have to begin somewhere,” he said, “so you put something down. Then you put something else with it, and then you see how that works, and maybe you try something else and so on, and the picture grows in that way.” He considered his collages to be paintings, and once said of them that, “any reproduction will suit my purpose, because, like the ancient makers of mosaics, I’m really drawing and painting with … paper.” As seen in this exhibition, Bearden’s approach was intuitive and inventive, an ongoing dialogue with tradition and innovation, in which he continually developed his ideas into an ever-expanding repertoire of motifs and images. Romare Bearden is represented in public collections throughout the country, and has had a number of major retrospectives, including a comprehensive exhibition organized by the National Gallery of Art in 2003 that traveled to the Whitney Museum of American Art, San Francisco Museum of Modern Art, Dallas Museum of Art, and High Museum of Art. An illustrated catalog with an essay by Sarah Lewis is available. DC Moore Gallery is the exclusive representative of the Romare Bearden Estate and Romare Bearden Foundation. Robert Kushner: Wildflower Convocation will be on view concurrently.